The B Hive’s Cruise Feasibility Study looks at the viability of creating new cruise destinations and the investment or improvements required to existing infrastructure and offerings. We focus on identifying potential issues and opportunities with the aim of answering one simple question: Does the investment stack up and is this destination appealing for the cruising industry? The B Hive adopts a strategic approach to problem solving and creating opportunities. And, since a feasibility study is a precursor to a business plan, it’s necessary to identify how, where and to whom you intend to sell the product or service. We therefore assess gaps, risks and constraints and equally the economic opportunity for the destination, as it’s critical for ports and local communities. The B Hive has a complete understanding of the cruise landscape, stakeholders, players and networks as well as unmatched cross-vertical tourism experience in all the relevant areas including Cruise, Transport, Wholesalers, ITO/Ground Handlers, Tour Operations, Hospitality and Sightseeing Tours. Why a Cruise Feasibility Study? You want to develop your capacity and infrastructure for cruising or develop new types of cruising e.g. expedition, luxury, etc. 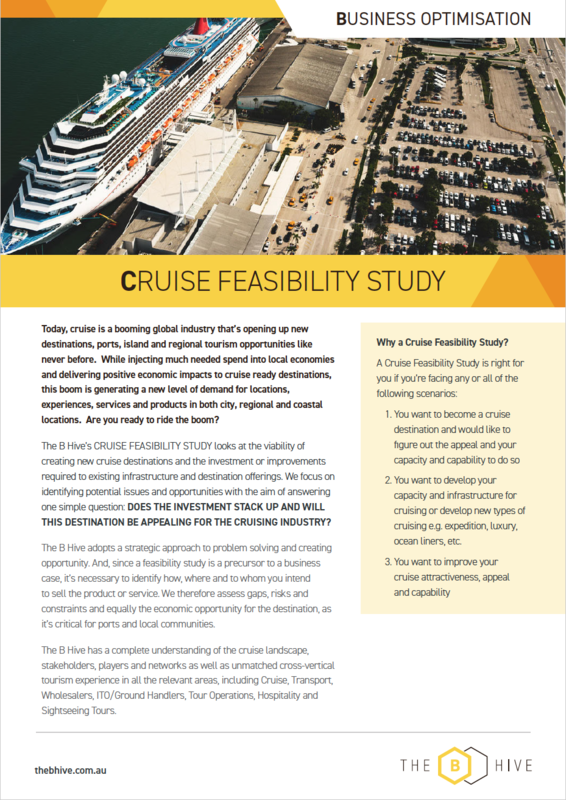 What are the main components of a Cruise Feasibility Study? What’s covered in a Cruise Feasibility Study? The time line is approximately 3 weeks in duration.